While I was listening to my sister talk at my mom’s funeral about all of the things my mother had saved through the years, it made me sad. Of course, I was sad about the loss of my mother, but I was feeling a bigger loss. It is entirely possible that my generation is the last to know what it is like to find a treasure trove of documents our parents have saved. There were old photos, letters from camps and trips, programs from theater productions, the occasional newspaper article and a stack of old report cards. So much of our communication is fleeting and digital these days. People pull out phones to share photos, but there is nothing left behind. We send emails to communicate or messages on social media, and they disappear. My kids’ report cards are electronic. They are gone at the end of the year. I did not think about it until yesterday. As the minister so astutely observed, my mother’s desk documented full lives – the ordinary and the exceptional moments. We can revisit my mother’s life and ours as well. There is a bond that defies understanding in that documentation. Maybe it is the history teacher in me that reacted so strongly. Maybe it is the mother in me that worries about my children in the future. Either way, I will ignore pleas to save paper and not print. I will print the report cards, get pictures printed, keep the scraps of paper. I owe it to my kids to go a little old school here. I have finished the first truly thematic unit of this year in our freshly revised US history curriculum. The theme was American Immigration. We began with the essential question which would drive the research and ultimately be what students would answer for their summative assessment – “What does the history of migration to the US tell us about immigration today?” The original wording was a little more complex but it confused students. I recalled Martinez & Stager’s advice in Invent to Learn that all good prompts should fit on a post-it note and simplified it. The general plan was for students to work to research immigration in order to answer the question. The first step was for each class to generate a set of sub-questions that they believed they needed to be able to answer in order to answer the big question. They put those on a shared Google Doc so that anyone would be able to add notes and links to the document. Then each section decided how to organize themselves – one class tackled the sub-questions, the other grouped the questions into themes and divided accordingly. To aid them, they had the book American Immigration from the Very Short Introduction series published by Oxford University Press. Classes alternated between research sessions and more discussion based work, with the aim of learning and sharing. The last class before the in-class essay was structured as an EdCafe. 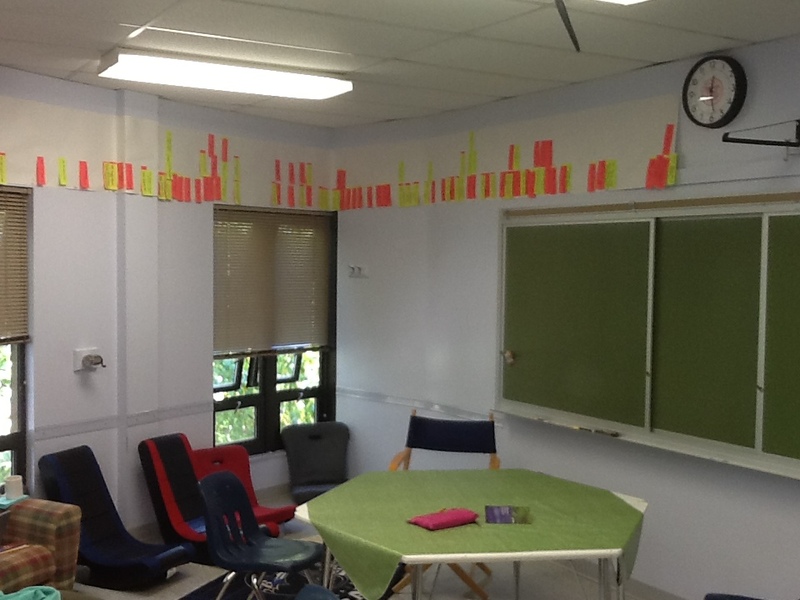 Students generated the topics they wanted to discuss, filled in the schedule and divided up as they wanted. One section did only small groups. The other section decided that they all wanted to discuss the question, “What is the American identity?” so the last session was the whole class. I encouraged them to test their ideas and their arguments on one another, working through their thoughts before the essay. Some definitely took my advice. For the final class of the unit, students could bring a note card with anything they wanted written on it to write the essay. Often, I allow students to access their notes or the internet for a writing assignment. In this case, we decided to limit the students to a note card. They had limited time and would be more successful if they had really planned ahead, knowing they could not simply rely on looking everything up. I was a little nervous when it came to reading the essays. Students had been in control of the conversation in this unit, and much of it took place in small groups where I was not always part of the discussion. In truth, the essays had some holes. Many students made assertions they did not back up with evidence. Others tried to cover so much territory that they left out crucial elements, thus skewing their argument. These are both important learning opportunities. The students who were most successful were the ones who stuck to the assertions they could support with evidence, the ones who included discussion of laws and policies, rather than relying on what they assume to be public opinion. In short, it was a mixed bag – not at all unusual for a first set of essays. The difference here is that the students arrived at their destination by their own routes, not mine. There are always kids who take a wrong turn, but this time it was their choice, not a result of ignoring me. Then came the reflections. I fully expected students to be grumpy that I had not provided more structure, more guidelines, more information. What I found was that most students really looked at their own process (which is what I asked them to do), reflected honestly on what they might do differently in a research unit next time. They were positive about finding their own paths, and many commented on how much they liked the small group discussions for learning from each other and testing out their own ideas. There were a few people who wanted something to have been different, but overall it was affirming for inquiry-driven learning. Still, while I think I can say this unit worked, I will not be able to call it a success until I see the students digging deeper, being more careful with their assertions and providing evidence to support their ideas. For me, the biggest takeaway from this unit is knowing exactly what I need to help students with as the year moves forward. To be continued…. Thematic US History: Part IV – The Trenches? I was so excited to launch into the first thematic unit of the year – American Immigration. I started with the essential question that will be the final question my students answer at the end of the unit. “What does the history of migration to the US tell us about the issue of immigration today?” The first step was to list the sub-questions we would need to answer in order to be able to tackle the big question. Then my students set out to begin to research the answers to the questions. One class immediately put the questions on an editable Google Doc. The other class decided to organize the sub-questions into four themes to research. So far, so good. Homework was to read one of two pair of chapters from their American Immigration book. The unit plan calls for the fifth class to be an EdCafe where students can organize discussion around the topics/questions of their own choosing. Then, in the sixth and final class of the unit, the students will write an in-class essay answering the essential question. Today was the second day of the unit for both of my classes. It was also a Monday. I had a vision of students coming into class, breaking into groups based on what they read, discussing the main ideas from the homework reading as they related to the main question, making notes to share with the rest of the class, and then figuring out what they still needed to research. The reality did not live up to my vision. Several of the students were not prepared for class; groups had to be prodded to talk about the historical events rather than be satisfied with vague generalizations to the effect that people do not and have never liked change. Towards the end of class, I told them that I was really disappointed with the level of work in the room. After that, they did hunker down and focus more, but we are left with a lot of work to do next class. For my second section, I had the plan be more fluid with students discussing the homework reading or doing more research, as they saw fit. The key was simply to work on researching their themes about immigration. It went better. I told both classes that they need to be prepared to discuss what they have learned about immigration next class, which is in two days. They will be divided into small groups at first, then we will come together for whole class discussion. After debriefing, we will formulate a plan for next steps based on what they still need to do in order to answer the main question well. I had in my mind that this process of inquiry-based learning would be intuitive, but it is not for all of them. I want them to come together as a learning community, realizing how much they can do and learn when they work together. I hope they will wrestle with ideas and challenge each other respectfully, bringing out the best in each other. I am confident that we will get much closer to that ideal than we are now. It is hard to break myself of the habit of looking for success and failure on a lesson by lesson basis. I will not know if this unit works until it is over. Struggle is part of learning, but it can be very frustrating to watch. I started this post with the analogy of the trenches, meaning that we are now in the thick of thematic teaching, with no turning back. Beyond that, I hope that the trenches reference falls flat; trench warfare brought a lot of suffering and resulted in stalemate. When I started the journey of documenting my shift to thematic teaching of US history, I promised myself I would not document only the great days when everything comes together but also the challenging ones like today. Which events should we place on the class timeline? It was an incredibly basic lesson plan – one question posed to the class. While decidedly simple in design, I was not sure what I would get. Would all students be able to come to a consensus? If they could not agree, would they lose interest and give up, leaving me to make the final decisions? Would they decide too quickly leaving me with precious class time available and no activity to fill it? For the majority of classes, I had students working on themes, in small groups or with partners discussing what they thought were the most significant events for any given time period. By the time we got to the last chapter, I just posed the question to the class. What I did not expect was the sophisticated discussion that resulted from the admittedly artificial direction that we could only include 10-13 events from each chapter that we read. At first there was some resistance about having to choose when we could just put everything on the timeline. Then, as we moved through history, making choices as a class, some interesting things happened. My students began discussing the criteria for inclusion – should it be something that we know was important in hindsight or something that people at the time thought was important? How should we balance political, social and cultural history? Could we use a single event to symbolize a larger episode or trend in history? Does global impact matter, since we are in a US history class? As students wrestled with these questions, they argued passionately for including Earth Day as symbolic of the environmental movement, Title IX for its impact on women, sports, colleges, and as a reminder that the ERA was not ratified, the fall of Saigon as symbol of US failure in Vietnam, and the Coup in Chile to signify US interference in the domestic affairs of other countries. My fear with so broad and quick an overview (we have “covered” all of US history in a month) was that it would be too superficial. It turns out that the discussion was anything but superficial. Whether or not they realize it, my students were articulating their views about history and their sense of who we are and should be as a nation by the arguments they crafted.